Rhoda’s second year in office was an active one. 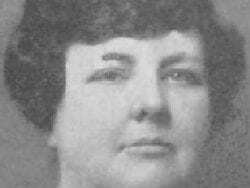 She pushed a bill restricting the slaughter of tubercular cows to their home county rather than performing the job at a central location; was in a serious train derailment that killed the engineer, but she and Perle emerged relatively unscathed; argued for higher tariffs on incoming farm goods to protect locals; was reelected vice-chairman of the County Republican Committee; and won reelection to the Assembly. 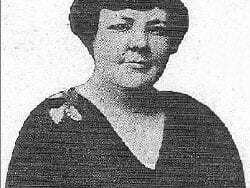 In 1927, her legislative goals included: adding a gasoline tax to fund construction of county and state roads; instead of ending county roads at village perimeters, extending them through villages to connect with state highways; banning exhibits of butter substitutes at local, county, and state fairs (substitutes hurt the incomes of farmers); abolishing the 30-day-resident voting rule in districts that didn’t require personal registration (moving day in New York for thousands who rented farms was November 1, just before Election Day); a bill to separate the town of Oswegatchie from the city of Ogdensburg; and the appropriation of $1 million to nationally advertise in the US and Canada the wonders to tour in New York State. She also visited sites across the district, stayed in touch with constituents, and spoke often at public events during what was her third Assembly term — again, unprecedented for women. At every opportunity, including many speaking engagements, she reached out to other women, encouraging them to enter politics, which, she said, “Is a means to a better life. State government is only housekeeping on a large scale.” And it was true. Traditionally, women had managed the home and addressed everyone’s complaints and needs, which was essentially the job of legislators on a statewide basis. She applied that notion first to her own district constituents, and then to New Yorkers in general, which is why, despite being solidly Republican, she supported programs that some colleagues deemed socialism. 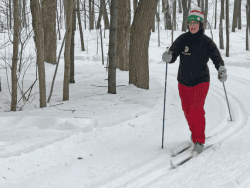 But what mattered to her first and foremost was serving the needs of North Country folks, so if poverty or some other need was an issue, she sought legislative solutions. The party’s needs came second. 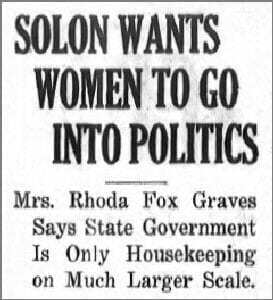 It was difficult to overstate the value of Rhoda Graves when it came to the ongoing battle by women for equal rights, for even in 1929, her fifth year in office, she was the only female member of New York’s legislature. Early in the year, photographs of the Equal Rights movement leaders, including Rhoda, appeared in many newspapers, accompanied by their agenda. 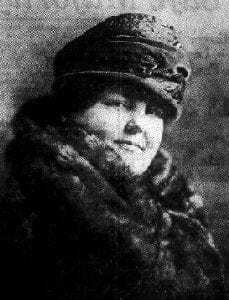 She pursued a number of those goals that included equality in serving on juries (only males could serve at the time), earning old-age pensions, receiving compensation for a range of occupational diseases, allowing separate legal domiciles from husbands (by law, only men could have them), allowing women to work after 10 p.m. in restaurants, and, men aside on this one, providing access to contraceptive information. In February, her Assembly position appeared to be in jeopardy due to a reapportionment plan that would combine two northern districts, forcing her into a runoff election. However, the proposal, almost identical to one vetoed by Governor Al Smith in 1926, was vetoed again, this time by Governor Franklin Roosevelt. It wasn’t the first time her future was challenged, and it wouldn’t be the last. In April, her bill establishing the New York State Bureau of Publicity was signed into law by the governor, laying the groundwork for wide-scale promotional efforts that continue today through various state entities and have brought untold billions of dollars worth of business to New York. The Adirondacks and foothills have benefited immeasurably from such advertising campaigns. Added the writer, “Folks around Gouverneur, where Mrs. Graves lives, call her Rhody. And she likes it.” As for her thoughts on the possibility of electing a woman governor, her response was absolutely prescient — “She thinks that it would be less improbable to find a woman senator emerge.” Was it merely a flippant comment, or a knowing glimpse of the future? Time would tell. Year after year she was reelected to the Assembly, and continued pushing important bills that hadn’t previously passed for one reason or another. There were many new responsibilities as well, including membership on several committees overseeing agriculture, the reorganization of state government, and welfare and religious societies. She served on the Joint State Legislative Committee on Farm-to-Market Roads (the first New York woman placed on a special committee), seeking solutions to the dirt-road issues that continued to plague upstate farmers. She also sought financial aid for one-teacher school districts that were the backbone of rural education, but were overburdened by costly state mandates. All the while, she kept getting reelected, and in November 1931 was returned to office for the eighth consecutive year by one of the largest vote margins of her career. In 1932, with a focus on protecting small farmers, she called for a full investigation of milk pricing, citing widespread corruption that left minimal profits in the hands of producers. She also pushed for changes in juror laws, equal guardianship rules, and other issues that were bogged down (or rejected) by lawmakers in the past. Whether it was frustration with the Assembly process, or simply an aspiration to higher office, she began considering a run for New York’s Senate, where no woman had ever served. Among the stark realities to consider: the attempt alone involved risks that could completely dismantle her political career. From most perspectives, in fact, absolute failure was the likeliest outcome. Among the plethora of reasons not to run for the Senate, several were very compelling. Rhoda was an outlier in ways that most Republicans weren’t. Members were expected to toe the party line and follow the precepts laid out by GOP leaders. In exchange, they received full party support on most endeavors. But Mrs. Graves had bucked the system at several turns. Her public agreement with Democratic Governor Al Smith on certain issues was anathema to Republicans. She rejected the hydropower lobby in favor of local control, and battled other big-business lobbies like telephone companies and milk dealers, in favor of citizens who were overcharged and small farmers who were struggling to survive. As she saw it, her primary duty was to district constituents, but as the party saw it, she refused to pledge allegiance to the full GOP agenda, and that kept her in constant disfavor. Republican leaders didn’t want a woman in the Assembly back when she first decided to run, but she had won. Then, year after year, they were perplexed at how to counter the popularity that kept her in office. Aside from all that were two monumental obstacles to winning a Senate position. Party machines were very powerful, and few were as entrenched as the one controlling New York’s northernmost counties. At the head was US Congressman Bertrand Snell, who had become a national powerhouse since his election to the House of Representatives in 1915. He won chairmanship of the powerful House Rules Committee in 1923, with an eye towards eventually becoming Speaker of the House. That plan fell by the wayside when Republicans lost the 1930 midterms, but Snell won a tough battle to become House Minority Leader, a position he would hold until retirement in 1939. Clearly the man wielded great power. Any action by Rhoda against the Snell-led regime could well end in disaster. Besides that basic issue, there was in place a longstanding “gentlemen’s agreement” between Franklin and St. Lawrence County Republicans (to the exclusion of Clinton and Essex Counties, which were part of the same Congressional District, but were not in the same Senatorial District). Rather than battle it out for total superiority in a heavily Republican area, party leaders had decided that St. Lawrence County would field candidates for the House of Representatives in Washington, and Franklin County voters would support them. In exchange, Franklin County would nominate state Senate candidates that would be supported by voters in both counties. That informal arrangement, adhered to for decades, was presumed insurmountable for anyone aspiring to office outside of those terms. To break that agreement was to challenge the authority of party leaders, including Snell, a longtime beneficiary of the arrangement because it eliminated election competition. With all that to consider, Rhoda, who had rocked the GOP boat considerably by running for the Assembly in 1920, would have to capsize the ship if she hoped to win a Senate run. And the decision was made: if that were the case, then so be it. Such a move was no less than a coup attempt, seeking to wrest control from the Snell organization that had long held power. Her ace in the hole was a great number of loyal followers scattered throughout the district, who, in her estimation, were reason enough to join the race. Next week, part 4: battling men in a man’s world; taking on a powerful political machine. Photos: Rhoda Fox Graves, Watertown Daily Standard (1926); headlines, Watertown Daily Standard, (1927); headlines, Rochester Times-Union (1928); headlines, The Evening News, Tonawanda (1932); headlines, Rome Daily Sentinel (1932). Great story about someone most have never heard of. Thank you!